Marissa Farrar: Something for the Weekend! Gothic eBook Giveaway with author Carole Gill. Something for the Weekend! Gothic eBook Giveaway with author Carole Gill. Welcome to my second, 'Something for the Weekend'! 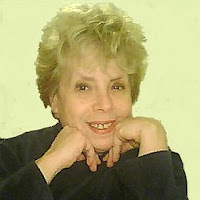 This week I have fellow Vamplit and horror author, Carole Gill here to talk a little about herself and her work. 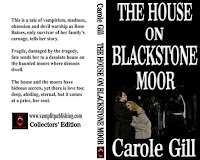 She is also giving away THREE copies of her Gothic novel, The House on Blackstone Moor. M.F. Hi Carole, thanks for stopping by my blog and sharing a little about yourself and your work. Let’s start with the most important thing: your books. Give us a brief description of the novel you want to talk about today. C.G. I write horror and sci fi and am widely published in horror and sci fi anthologies. My first love is horror though, reading it and writing it. My first novel, The House on Blackstone Moor, is a very dark novel indeed. It's been called intense and has been compared to Wuthering Heights and Jane Eyre. The reviews are so terrific. I remember how the idea for it came about. I happened to read the gothic romance novel was dead. I didn't like that one bit. I started to think about it. I think actually if Wuthering Heights, Jane Eyre or Rebecca were written today, for today's reader, they'd be far darker. I also think they'd have storylines that would have ensured that they never would have been published. The world has changed a lot and fiction must change with it, at least this sort of fiction. I have had men telling me they enjoyed the book, adding how they wouldn't have ever thought they'd enjoy a book like that. The novel's themes are vampirism, madness, obsession and devil worship. Both human and supernatural evil are closely examined. I always thought human evil could easily give supernatural evil a run for its money. Rose Baines comes home to find her mad, incestuous father has killed himself and her family. She survives a madhouse to become governess at a remote home. The house and the family that dwell within are not what they seem. There is unimaginable horror and suffering but there is love too, not merely the promise of it. Sadly, it comes at a great price. The idea for the story came to me in this way: i envisioned a grand looking house on barren moorland. Then I began to picture the people who dwelt in that house. In truth, the characters wrote the story for me! I am a seat of the pantser (I don't write with an outline) I've tried and can't do it! I re-read all of my favourite novels: Jane Eyre, Wuthering Heights, Rebecca, My Cousin Rachel (to name a few) and the narrative came to me quickly. I think I became Rose Baines as in I AM Heathcliffe! C.G. The sequel, Unholy Testament will not disappoint the fans of the book! There is plenty of darkness and romance too, but the much hated and adored (he's so campy and outrageous), Eco the demon spawn is featured in the sequel. The story involves a journal covering many epochs as well as an odd bunch of passengers travelling on a transatlantic steamer. There are a lot of surprises and shocking horror along the way! M.F. When did you first start writing? C.G. I wrote my very first story at age 8. It was science fiction--something about Martians coming to earth to take the children back. My parents were both sci fi fanatics and I suppose it was natural for me to write this! I followed it with a second sci fi story and then some years went by and by the age of 11, I was completely besotted with Poe. My father used to call me Edgarina Allan Poe. My writing by that time was starting to worry my parents as everything was so heavy and bleak. They asked my teacher if she thought I was 'okay.' She told them she did and she said in her opinion it had to come out. She told them to just let me write and things would get less scary! That was true but up to a point because I do write pretty dark stuff. M.F. I take it things didn't get less scary then? Your childhood sounds a lot like mine -- I was forever writing scary stuff. So what type of writing style do you adopt? Are you a pantser or a plotter? C.G. I didn't realize I was a pantser until finally after countless attempts at plotting failed, I admitted the truth to myself. We are what we are. I wish I could plot it out, but I can't. But I'll tell you something, I love the excitement of not knowing where exactly it's going or how it's going to get there! I love that actually! I mean these passengers on the ship in the sequel, they are so different, they just interact and I get my story! M.F. Who is your greatest influence? C.G. The Brontes are without a doubt as well as Daphne DuMaurier. Their novels are unforgettable. They wrote strong stories with hugely interesting characters. The narrative in those books is like a great dark, sea that sweeps the reader along. We stay afloat, but it is a perilous voyage, which adds to our excitement. There is darkness in their novels, horrid secrets yet love too. What else does a book need?! C.G. I write for those readers who wish to read strong stories with larger than life characters. I want to appeal to those lovers of gothic romance but at the same time to entice new readers into the genre! M.F. What is the last book you read? C.G. Great Lion of God by Taylor Caldwell. It is a novel about Saul of Tarsus who would go on to become St. Paul. It is a brilliant book. M.F. Wow, sounds good. I love recommendations. Now for some more abstract questions: If you could be any character in fiction, who would you be? C.G. Jane Eyre. I think I always felt like her anyway! I could feel all that she felt. I certainly can picture her world. I have the greatest sense of her too. I always did for some reason. C.G. Hmm. This is almost biblical! The devil and Christ? But it's aliens! I better be careful here? No! Heck, I'll just be honest. I would love for my books to be read by lots of readers, I want to bring scores of readers into the gothic romance fold! That's what I'd want. C.G. I went to acting school many years ago. Actually I use the skills I learned there. I method write! We were taught 'The Method,' which is to become the part. You are told to pull something out of yourself, your past and use that to feel or become this other person. I do that with my writing. I WAS Rose Baines! I saw my family all dead in front of me, with their throats slashed! It was easy then knowing what would happen next. The story just evolved. I don't start writing until I have a thorough sense of my characters. As soon as I do, I begin! So acting school is something few know about! And Al Pacino went there, but I went much later, darn! M.F. You went to the same acting school as al Pacino. Now that is impressive! Thanks so much for taking the time to stop by. The House on Blackstone Moor sounds like a great read and I know it's been getting brilliant reviews. So, would you like to read Carole Gill's novel? She has kindly offered up three eBook copies of her book, so just leave her a comment below, together with you blog/web address or email addy so we can contact you if you win! I'll announce the winners on Monday. Good luck everyone, and have a great weekend. She loves to scare herself and others with her horror fiction and is widely published in horror anthologies. 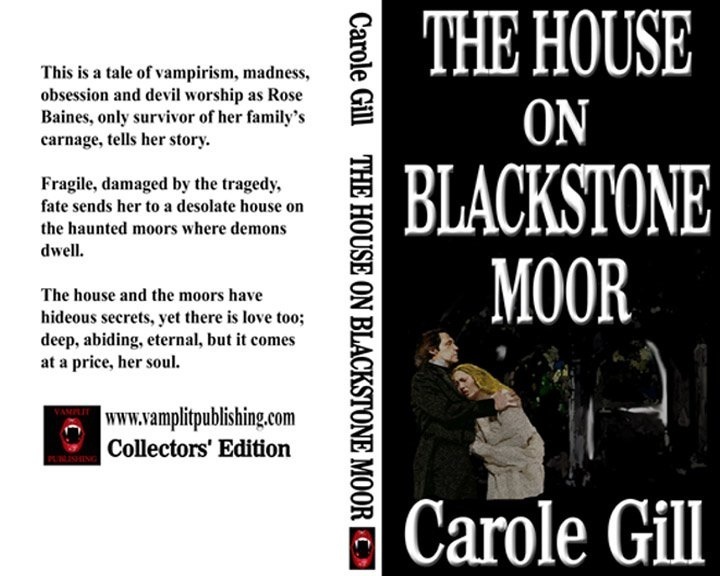 Her gothic horror novel, THE HOUSE ON BLACKSTONE MOOR, is on sale at Smashwords. The paperback version will be out in May. Pre-orders are being taken at eBookundead. The sequel, Unholy Testament will be published by Vamplit later this year. She would love for you to stop by her Website, Blog, or Facebook Page. You can also follow her on Twitter! Excellent interview, Ms. Farrar, and, of course, thank you, Edgarina, for your candor, talent, and for offering your fans and fellow writers/authors another tool to add to their kits--that of method writing! Sounds, too, like your parents helped instill in you a love-of-story. Bless 'em for it. I was expecting to see this up tomorrow, but being a day early is fine with me since I've been waiting to read this. A treat for Blaze! Marissa, you are doing a great job with these interviews, and, Carole, you are the perfect person for this type of laid-back explanation of how you came to the craft and what motivates you. Even though our words might be written differently, our approach is the same: let it flow uninhibited. Ah, that is so good. I am hoping I don't have to wait too long for the next novel to come out, or the one after that, or the one after that. I would love to give it a read. This was a great interview, Marrissa! Sounds like a terrific book.